Receive an Email Alert each time a story is posted to MND NewsWire. MND NewsWire features plain and simple interpretations of industry related data and events written in a manner that maintains the interest of random readers while still catering to the perspective of a housing market professional. 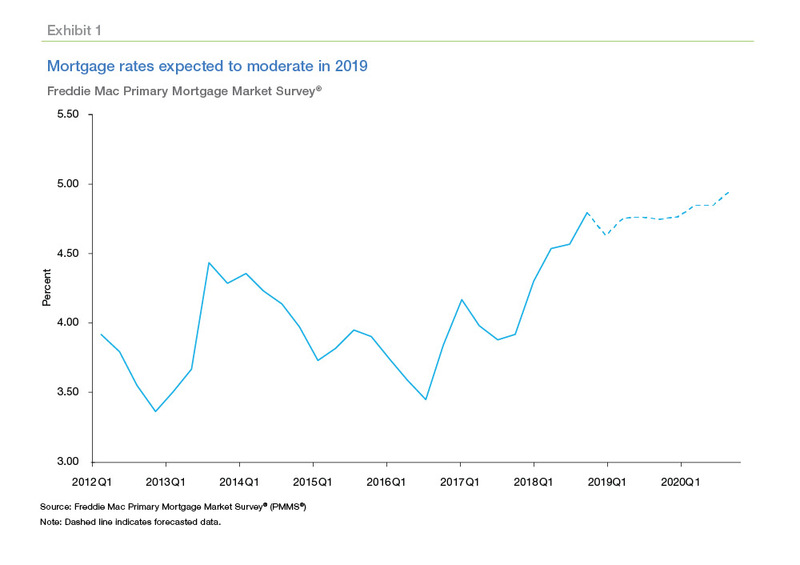 Freddie Mac's Economic Research Group says in its January forecast that much of the volatility in the mortgage market since the end of the year has arisen out of speculation about the Federal Reserve's future moves vis-à-vis rate hikes. Because of this they have begun including their estimates for the Federal Funds Effective Rate in their monthly forecast. They have ratcheted back their prediction to only one rate increase this year and expect the fund to average 2.3 percent in 2019. It will then hold steady at 2.5 percent for each of the four quarters in 2020. The current estimates for the fourth quarter of 2018 indicate the growth in the U.S. economy slowed to 2.6 percent. It is anticipated the partial shutdown of the federal government starting in late December and lasting for most of January will have a negative impact on the first quarter of 2019. The economists estimate growth for all of 2019 at 2.5 percent with further slowing to 1.8 percent in 2020. Unemployment averaged 3.9 percent last year, the lowest rate in 49 years. Despite the shutdown and claims filed by furloughed federal employees, jobless claims fell 1.4 percent to 213,000 in the second week of January and the four-week moving average decreased 0.5 percent to 220,750, much stronger than in early December. Hourly wages jumped 0.4 percent in December an annual gain of 3.2 percent. Freddie Mac's economist expect unemployment to tick down to 3.6 percent and then return to a more sustainable 3.9 percent in 2020. The 30-year fixed-rate, which had been climbing for several months, reaching a seven-year high, took a breather starting in mid-November and fell to a nine-month low of 4.45 percent in early January. Because the Fed has indicated more caution about future rate hikes Freddie Mac has revised its mortgage rate forecast down. They now expect the 30-year fixed-rate to average 4.7 percent this year and 4.9 percent in 2020. The moderation of mortgage rates should, the forecast says, offer some relief to the previously strained housing market. Housing starts increased 3.2 percent in November to 1.26 million units and permits were up 5 percent to an eight-month high of 1.33 million. Both increases were due to gains in multifamily construction while single family building continues to be constrained by higher construction costs. December's residential construction report has been delayed by the government shutdown. 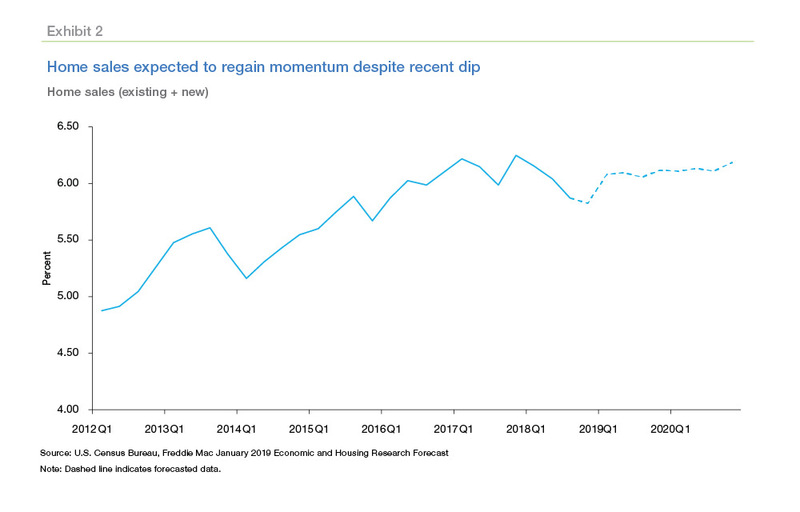 The forecast is for all housing starts to recover slowly over the next three years with both single family and multifamily numbers improving each year. Total starts will reach 1.29 million this year and 1.36 million in 2020. Home sales will also rise, increasing to 6.09 million and 6.14 million units this year and next. Existing home sales will drive this year's total; new home sales will remain flat. While still rising, home prices have finally begun to cool. 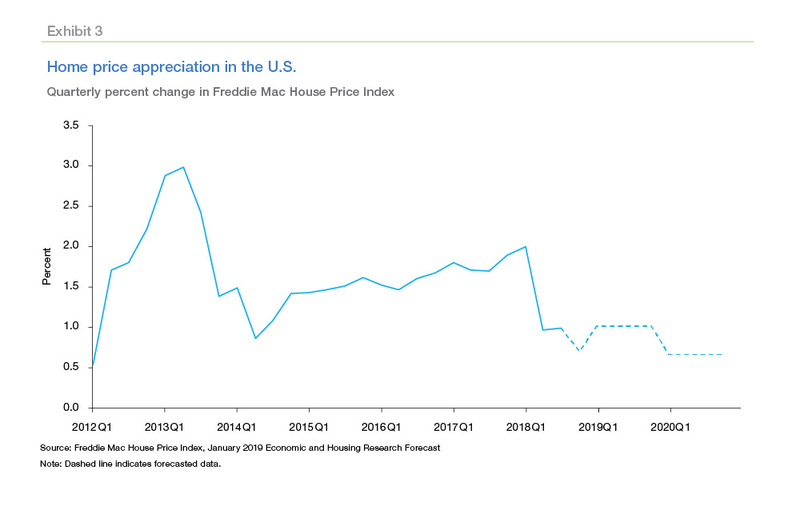 Freddie Mac's House Price Index fell slightly to 0.7 percent in the fourth quarter and is expected to increase 4.1 percent and 2.7 percent in 2019 and 2020, respectively. The economists expect single-family mortgage originations to reach $1.68 trillion in 2019, a 2.1 percent improvement, and remain at a similar volume in 2020. 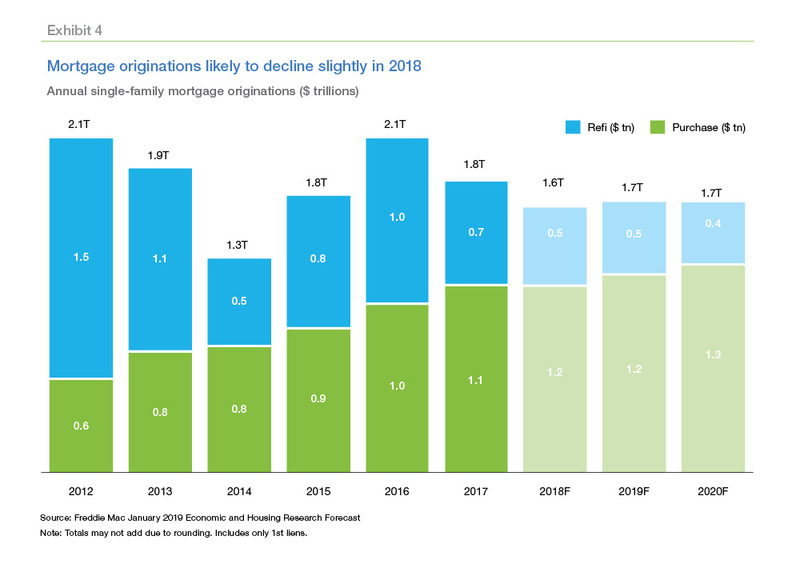 With lower mortgage rates they now forecast the refinancing share of originations to be 27 percent and 24 percent in 2019 and 2020. As well as adding an estimate of the Feds Effective Rate to the forecast, the economists have begun breaking out their predictions for new and existing home sales and single-family and multifamily construction numbers.